appear old, yet feel new. 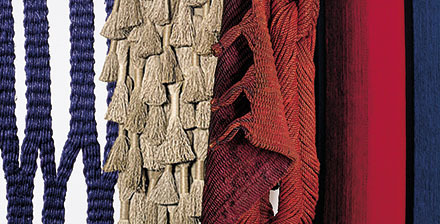 Throughout her career, Carolina Yrarrázaval of Chile has investigated and adapted traditional textile techniques from diverse cultures, especially Pre-Columbian techniques. 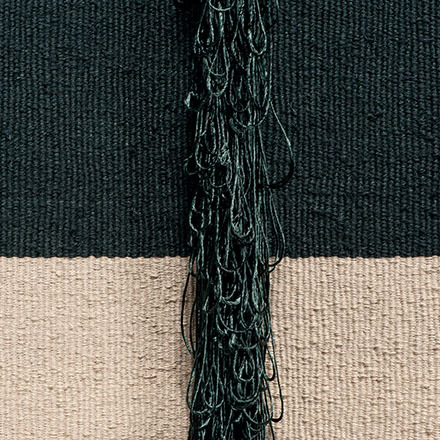 Her highly accomplished, abstract weavings are austere and sensual at the the same time. 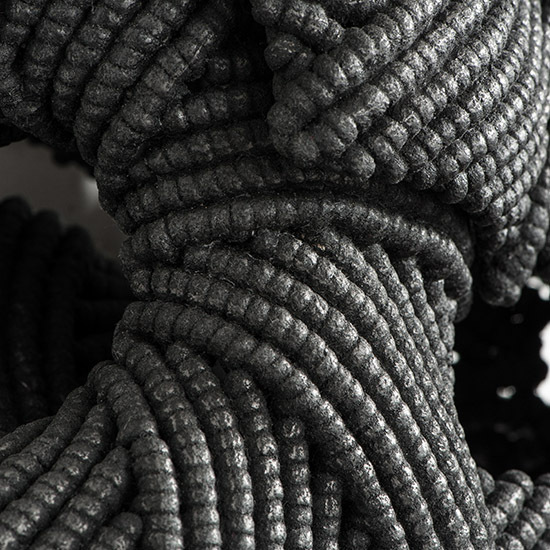 American artist, Randy Walker, takes an architectural approach, creating interesting and elegant constructions that use fine threads, cords and ropes to re-envision humble found objects. 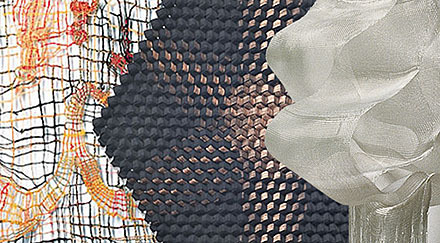 Recent works by this diverse group of artists will be featured in Influence and Evolution, Fiber sculpture…then and now, at browngrotta arts, 276 Ridgefield Road, Wilton, Connecticut from April 24th – May 3rd. The Artists Reception and Opening is on Saturday April 25th, 1pm to 6pm. The hours for Sunday April 27th through May 3rd are 10am to 5pm. To make an appointment earlier than 10am or later than 5pm, call: 203-834-0623. 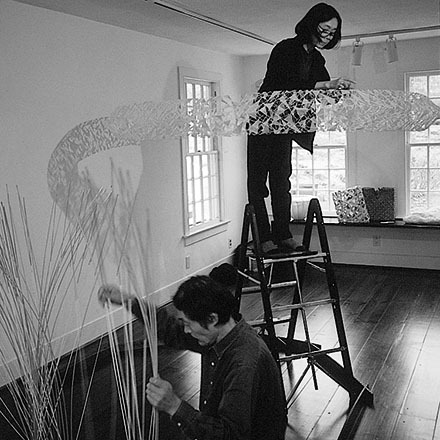 Works by Naomi Kobayahsi and Masakazu Kobayashi (who died in 2004) will be included in Influence and Evolution: Fiber Sculpture…then and now at browngrotta arts, Wilton, Connecticut from April 24th through May 3rd. They include a wave work by Masakazu, and two small pyramids by Naomi. 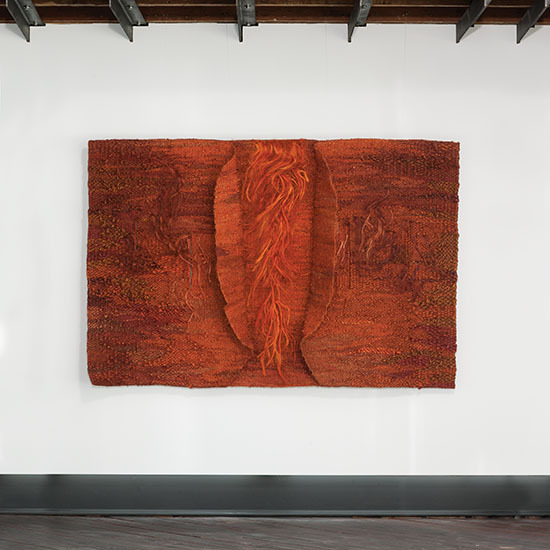 These works will be joined by another four dozen works, some by artists prominent in the 60s and 70s and others by artists born in 1960 or after, who have continued experiments in fiber. 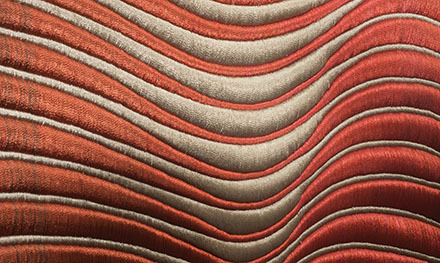 Influence and Evolution, which opens at 1pm on April 24th. The Artists Reception and Opening is on Saturday April 25th, 1pm to 6pm. The hours for Sunday April 27th through May 3rd are 10am to 5pm. To make an appointment earlier or later, call: 203-834-0623. 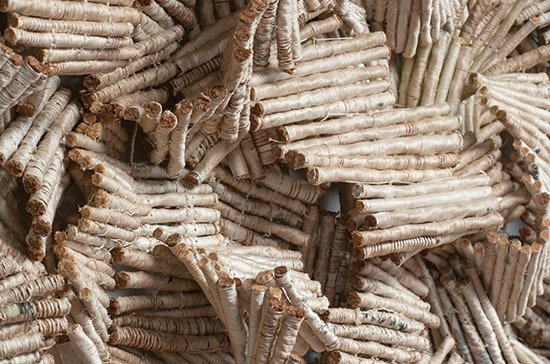 We hope you are planning a trip to browngrotta arts in Wilton, Connecticut to visit Influence and Evolution: Fiber Sculpture…then and now between April 24 and May 3rd. If you have the time and inclination here are a few other activities you might find of interest. 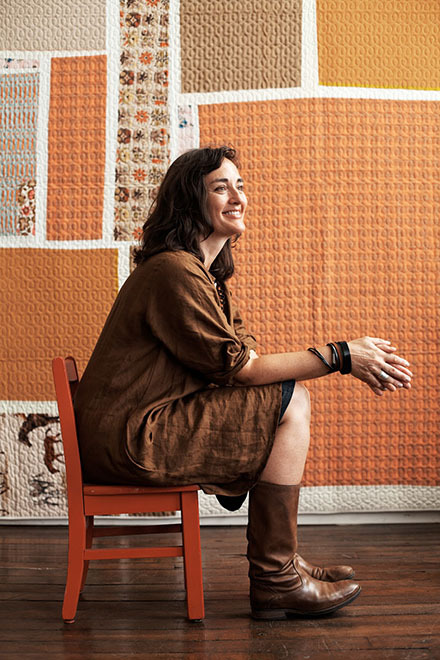 The creations in Denyse Schmidt: In The Making Historic Inspirations/New Quilts are modern interpretations of classic quilt designs – contemporary, functional textile art with deep historic roots. Schmidt’s quilts, with their quirky style and fearless use of color, are fresh and unexpected interpretations of traditional patterns like Rail Fence, Lafayette Orange Peel, Ocean Waves, Mariner’s Compass, Streak of Lightning, Wagon Wheel, Snake Trail, and Churn Dash. 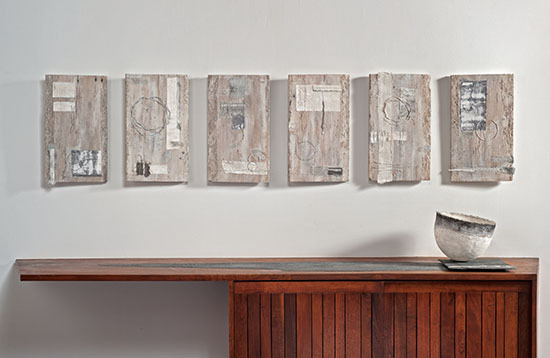 Many resemble abstract collage paintings, and all share their maker’s unselfconscious directness. 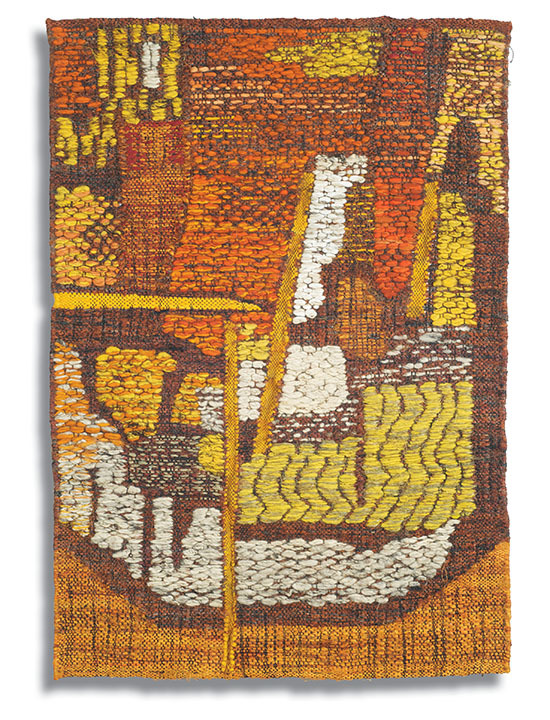 Also at the Society, One Loop at a Time: June Myles’ Hooked Art, hooked works, “painted in wool” in a style that finds its origins in folk art. The Wilton Library sale wilton-library’s-annual-gigantic-book-sale features more than 70,000 items sorted in more than 50 categories – mysteries, gardening, travel, and science fiction; gently used, collectible, rare books, DVD’s, CD’s, books on CD and a building by architect and designer Eliot Noyes. Notes was head of Industrial Design at MoMA and worked as consultant design director for IBM for 21 years collaborating with Paul Rand and Charles Eames in the first comprehensive corporate design program in America. Homes by Notes can also be found in nearby New Canaan. 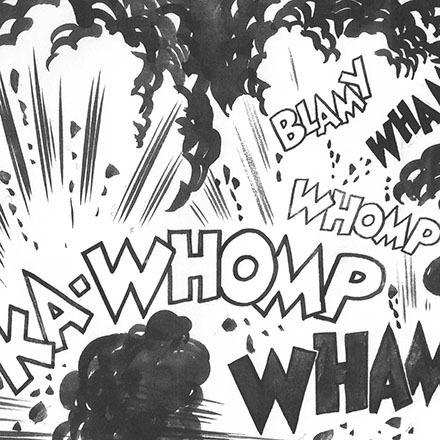 Learn more specifics in Eliot Noyes by Gordon Bruce. 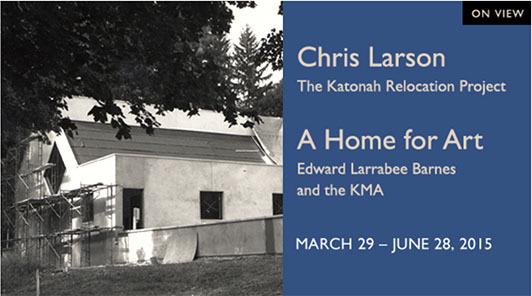 Chris Larson: The Katonah Relocation Project, the Museum explores the literal relocation of Katonah 122 years ago. By the late 1800s, New York City’s need for more drinking water necessitated the creation of a new fresh water reservoir in Westchester. The site selected for the reservoir included three towns, including Katonah, condemning them to be flooded. As reported on April 8, 1893 in The New York Times, “The doom of Katonah is sealed, and in two months the picturesque village will be barely more than a memory conjured up in the mind at the sound of its quaint old Indian name.” The residents lifted their homes onto logs to be pulled by horses along soap-slicked timbers, re-siting their town to present-day Katonah. With a nod to the Katonah narrative,Larson constructs a replica of the Mt. Kisco home of the KMA’s architect Edward Larrabee Barnes, as if it were dragged in on logs, elevated on timber cribbing, and pierced through by the Norway spruce trees. A Home for Art: Edward Larrabee Barnes and KMA celebrates the architect who designed the KMA. Trained by legendary architects at Harvard University, Edward Larrabee Barnes strove for simplicity and functionality in his designs for skyscrapers, museums, schools, botanical gardens, and private homes. The Katonah Museum project was unique in design—an intimate, light-filled space surrounded by the natural beauty of this idyllic hamlet located just 45 minutes from New York City. Unlike many large projects Barnes was to undertake, this one was as much a form of personal expression as architectural design, with the informal feel of a domestic space for art, as he worked in Manhattan but lived within family in nearby Mt. Kisco. 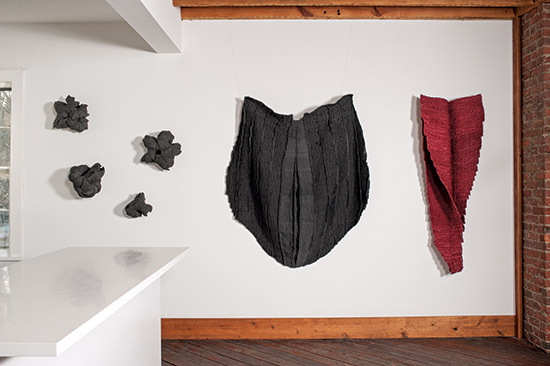 http://www.katonahmuseum.org/exhibitions/. 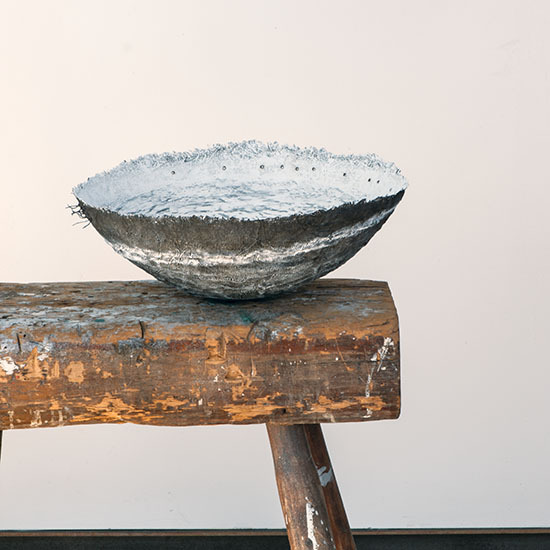 The Aldrich Museum of Contemporary Art, just up the street from browngrotta arts at 258 Main Street, Ridgefield, Connecticut, is between exhibitions between exhibitions, re-opening on May 3rd. However, staff there have told us they expect to have some of the galleries will be open, including possibly, Nancy Shaver’s Reconciliation, in which the artist will juxtapose recent sculpture made from women’s clothing fabric and other materials and objects found in rural thrift stores with Depression-era photographs by Walker Evans (who was one of her teachers) and images of the artist, fabric, and clothing designer Sonia Delaunay. 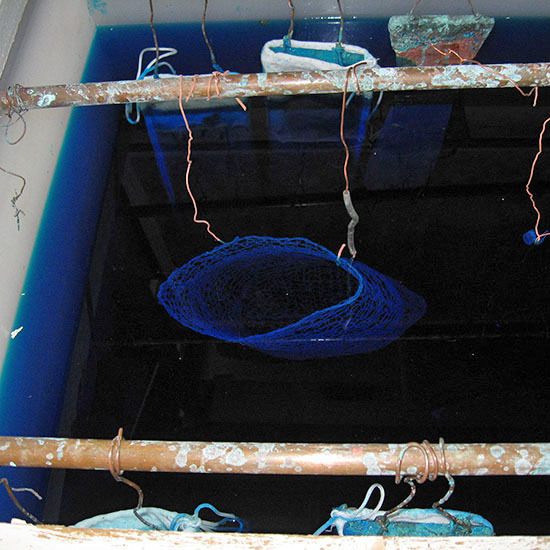 Call first to confirm: 203.438.4519. The Aldrich is just up the street from browngrotta arts at 258 Main Street, Ridgefield, CT. If you’d like a list of restaurants in the area, contact us at art@browngrotta.com. characters, and a great drama.” The youngest of this renown group, Ritzi Jacobi (born 1941), originally of Romania participated in 11 of the prestigious Lausanne Biennials and is represented in Influence and Evolution by a newer work, created in 2000. 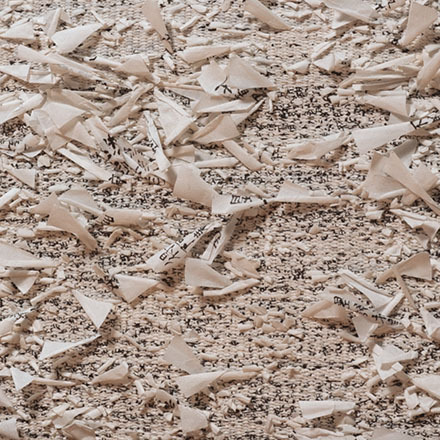 The exhibition will also include works from the 1960s by Polish artists Zofia Butrymowicz (1904 -1987) and Jolanta Owidzka (born 1927), a colleague of Abakanowicz in Warsaw. 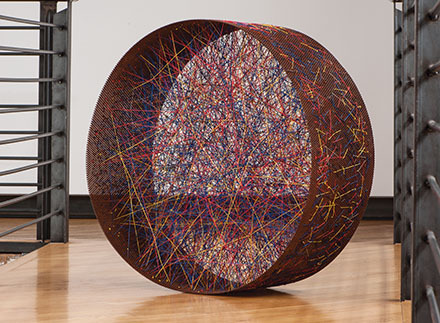 Influence and Evolution also features 15 artists, born after 1960, who approach materials, form and technique with a sense of exploration similar to that which characterized the 60s and 70s. 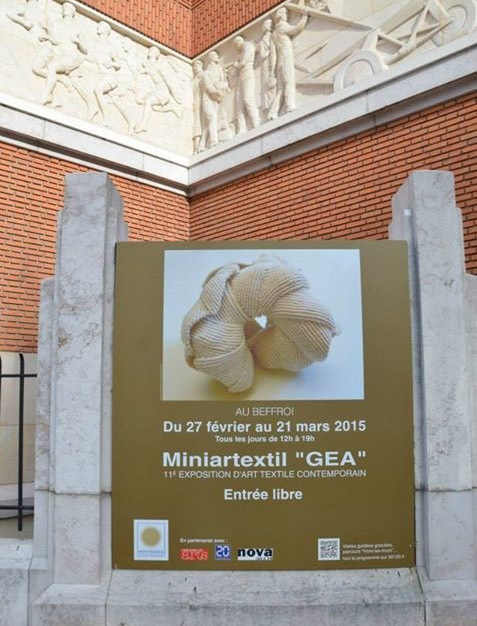 The exhibition opens at 3pm on April 24th. The Artists Reception and Opening is on Saturday April 25th, 1pm to 6pm. The hours for Sunday April 27th through May 3rd are 10am to 5pm. 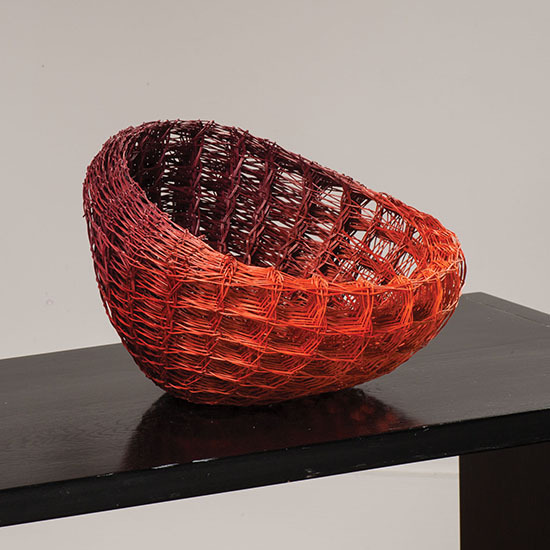 To make an appointment earlier or later, call: 203-834-0623.
studied Industrial Design and after graduating in 1992, she completed a three-year glass program and Espace Verre in Montreal. 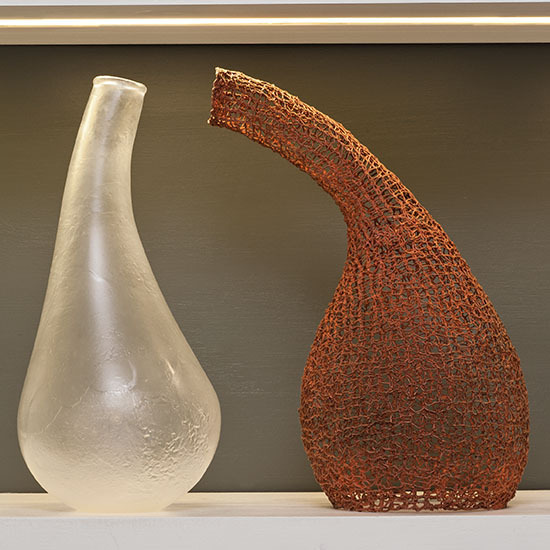 Each of Frève’s vessels conducts, “a converasation with a semblance of itself,“ in Ritchie’s terms, “a conversation between what is and what appears to be; between what we are and the image we project…” Freve’s vessels of glass and knitted copper will be featured in Influence and Evolution, which opens at 3pm on April 24th. The Artists Reception and Opening is on Saturday April 25th, 12pm to 6pm. The hours for Sunday April 27th through May 3rd are 10am to 5pm. 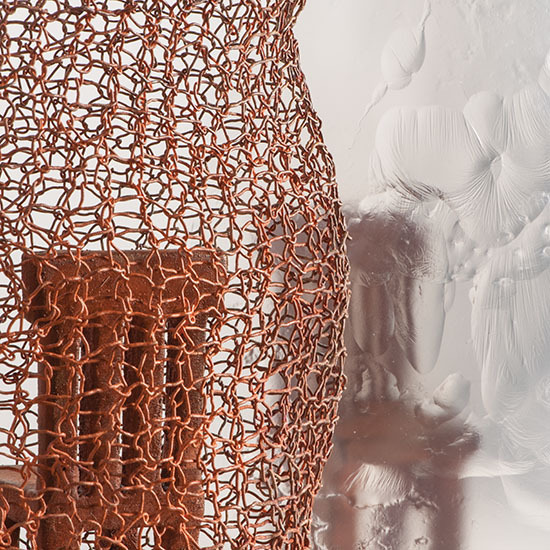 To make an appointment earlier or later, call: 203-834-0623.
carapace, cuirass, frame, carcass, skeleton, projectile, appearance, scale.” She uses a vertical loom which allows her to work thefibers from their frame to three-dimensions. She presents her works in a dimensional installation, “as if they were fragments of a galaxy: macrocosm and microcosm together; disseminations, sowing of fragile bodies aggregated magnetically and arranged in constellations or in an unknown writing.” A “constellation” of Luzzi’s black knot-like pieces is among the works by this artist that will be on display at Influence and Evolution, which opens at 3pm on April 24th. 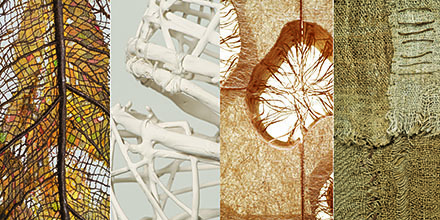 The Artists Reception and Opening is on Saturday April 25th, 12pm to 6pm. The hours for Sunday April 26th through May 3rd are 10am to 5pm. To make an appointment earlier or later, call: 203-834-0623.
final, essential ingredient in Max’s process. “It is paramount to my work,” she says. Influence and Evolution opens at 1pm on April 24th. The Artists Reception and Opening is on Saturday April 25th, 1pm to 6pm. The hours for Sunday April 27th through May 3rd are 10am to 5pm. To make an appointment earlier or later, call: 203-834-0623. 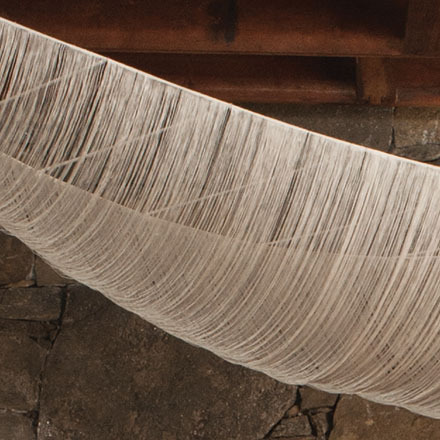 Gizella K Warburton is another of the artists whose work will be included in Influence and Evolution: Fiber Scuplture…Then and Now at browngrotta arts in Wilton, Connecticut from April 24th – May 3rd. 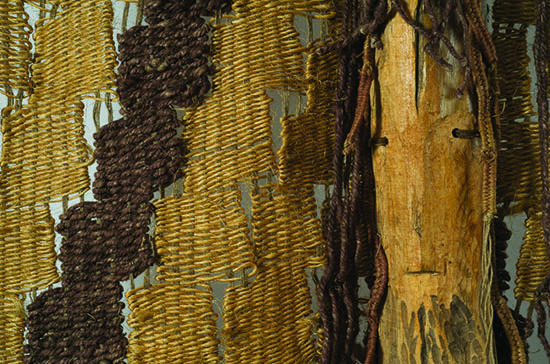 Warburton creates unique objects — framed, hanging and sculptural artworks and installations, including works on slate and weathered wood grounds, printed and woven elements, and sculptural forms and vessels. 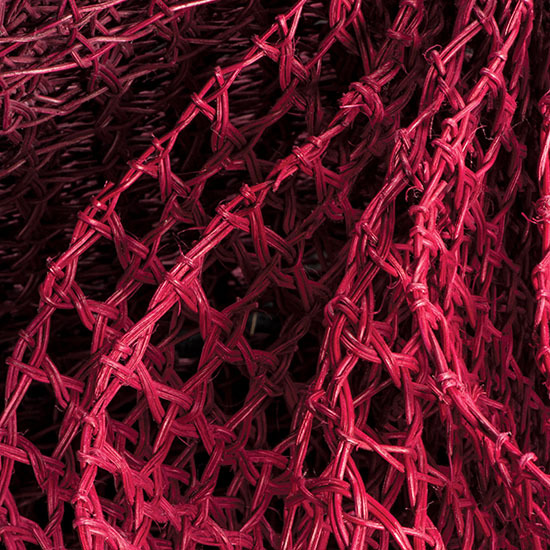 She has a BA Hons (First Class), Printed, Woven & Constructed Textiles from Manchester School of Art and a Postgraduate Certificate in Arts Practice with the University of Derby. 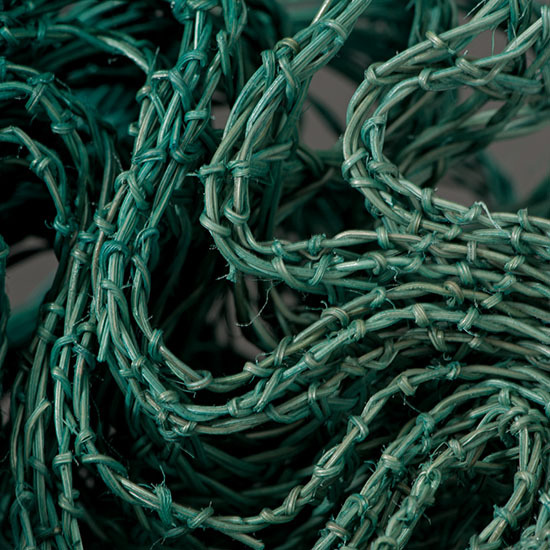 In addition to making exhibition work, Warburton has been commissioned to deliver numerous creative learning projects in partnership with Galleries and Museums and Heritage organizations. This includes roles as both practicing artist and Creative Agent with government- led initiatives such as Creative Partnerships. She has undertaken the “Artists Professional Development Programme: Developing Arts for Health” at Staffordshire University, which she credits with enriching her insight and understanding of the creative process, and its connections and impacts on human health and wellbeing. 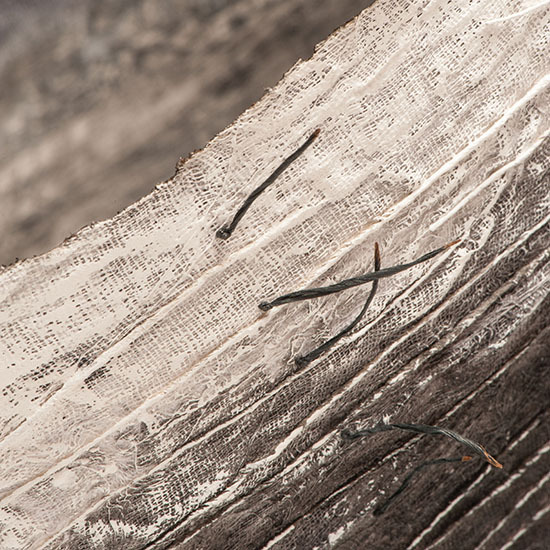 series of Warburton’s fabric vessels and mixed media textiles on weathered board will be featured in Influence and Evolution, which opens at 1pm on April 24th. The Artists Reception and Opening is on Saturday April 25th, 1pm to 6pm. The hours for Sunday April 27th through May 3rd are 10am to 5pm. To make an appointment earlier or later, call: 203-834-0623.